On March 10th, 2016 until March 23, 2016 Amaretto wanted to celebrate St Patrick's Day with some 2016 St Patrick's Day Edition Horses. The 2016 St Patrick's Day Edition Horses do have the ability to pass the eyes as well as hidden surprises. These 2016 St Patrick's Day Edition Horses have a chance at getting the eyes as well as hidden surprises from any breeding. The Surprises was the Overo Clover!!! 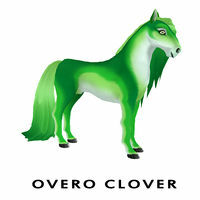 Overo Clover Coat DOES have the ability to pass! This page was last edited on 24 March 2016, at 22:14.